In medium bowl, stir chicken, 1/4 cup salsa and cilantro until well mixed. Spread 2 tablespoons beans over half of each tortilla. Top bean side of each tortilla with chicken mixture and cheese. Fold each tortilla in half over filling. Heat 12-inch nonstick skillet over medium-low heat. Spray both sides of each quesadilla with cooking spray; place 2 quesadillas in skillet. Cover; cook 3 to 4 minutes, turning once, until filling is heated and tortillas are lightly browned. Repeat with remaining quesadillas. Cut into wedges. Serve with additional salsa and sour cream. We really like the Mexican cheese blend, but you could use reduced-fat Cheddar or Monterey Jack instead. 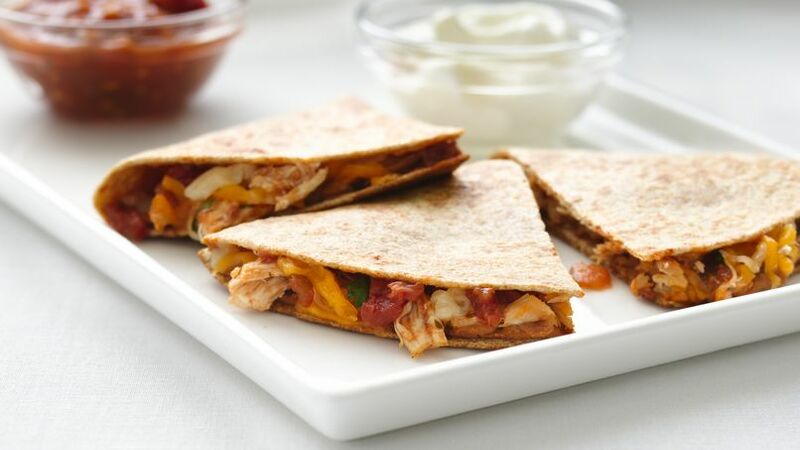 These quesadillas are a great quick meal—serve them with a tossed salad or some fresh fruit for lunch or dinner. 75% more fiber • 61% less fat • 25% more calcium than the original recipe. Mexican food is known for having lots of flavor. We were able to keep the flavor, while cutting fat and calories.